With its burgeoning population putting enormous pressure on an inadequate health infrastructure, persistence of high out-of-pocket spending on health, and increased demand for higher quality health care, India’s economic growth over the past decades seems to have bypassed public health. One of the largest public health concerns for Asia’s third-largest economy is its high levels of maternal and child mortality. Although India achieved several MDG targets three years before the 2015 deadline—on poverty, slums, and water—India fell short on MDG 5, which encompasses maternal health. Despite progress in reducing maternal and child mortality—a reported decrease in the maternal mortality rate (MMR) from 437 deaths per 100,000 live births in 1991 to 212 in 2007-09, this indicator fell short of the MDG target number of 109 deaths per 100,000 live births by 2015. Communicable diseases, including tuberculosis (TB), HIV, and malaria, also impose a heavy burden of illness and death on millions in India, while the burden from non-communicable diseases like heart disease, diabetes, and cancer is on the rise. High inequalities in health also pose a major challenge, with the eight poorer states of India accounting for 52 percent of the country’s population but 83 percent of its maternal deaths and 80 percent of its child deaths. A child born to scheduled caste or tribal household in India has a 50 percent higher chance of dying before reaching her/his fifth birthday than their higher caste counterparts. The Government of India (GoI) recognizes the need to bolster India’s health outcome indicators in line with the country’s economic growth trends. The Indian Government headed by Narendra Modi has shown political will to implement major reforms and overhaul the health system, proposing a series of health reforms to ensure affordable care and universal health coverage. In its 2015 National Health Policy, the Indian Government considers making health care a fundamental right, with its denial punishable by law. Delivering on these aims and meeting India’s growing health care needs demands strengthening of the health system through improved health financing mechanisms, evidence-based decision making, and research-driven policy formulation and implementation. Aiming to address the challenge of improving priority health services, particularly the reproductive, maternal, newborn, child, and adolescent health (RMNCH+A) outcomes, the USAID-funded Health Finance and Governance (HFG) project in India started by providing technical assistance to the six USAID-priority states of Haryana, Jharkhand, New Delhi, Punjab, Uttar Pradesh, and Uttarakhand, working in partnership with the GoI, partner institutions, and state governments. In the first three years of the project, HFG India focused on supporting health financing, ensuring more effective management of human resources for health (HRH), and improving the quality and use of data for decision making. Now in its second phase, the HFG project in India is working with local institutions and GoI to contribute to India’s achievement of key RMNCH+A health outcomes, HIV prevention, and goals to end TB. The current focus is on scaling up health insurance, particularly to meet the health care needs of urban poor; research and evaluation of innovative approaches to provide essential health services in areas such as family planning, TB, and urban health; and strengthening of civil society organizations (CSOs) to improve family planning uptake. HFG India is supporting the provision of affordable, quality health care to vulnerable populations. Given the critical bearing financial protection has on improved access, supporting the scale up of community-owned micro-insurance initiatives is a key activity for the project. 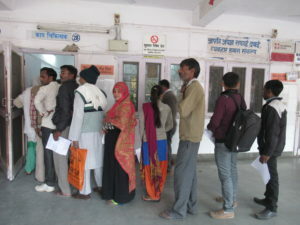 To document evidence for a roadmap for scaling up health mutual insurance, HFG conducted a landscape study of health insurance schemes in India; a study of mutuals, cooperatives, and community-based organizations (MCCOs) in the country; and a case study on a functioning health mutual scheme. Collaboration with the USAID-funded Partnerships for Affordable Healthcare Access and Longevity (PAHAL) project is a crucial component of HFG’s strategy to improve access to affordable health services by the urban poor. To this end, HFG is working to design insurance products that cover primary health care services and are affordable for the urban poor. Seeking to develop a comprehensive health insurance scale-up strategy, HFG is, together with PAHAL, organizing a technical consultation meeting of key stakeholders (government, regulator, insurers, providers, and experts from other donors/partners) to discuss the insurance landscape and initiate collaborative action for bringing health insurance to the urban poor. These activities will add to the significant health financing work HFG undertook in its first phase, where the focus was on supporting institutionalization of State Level Health Accounts. Health Accounts (HA) results allow health stakeholders to gauge the effectiveness of health financing policies that aim to support the provision of priority services to poor households. Understanding the magnitude and flow of financial resources is an important element in making informed decisions for equitable and efficient allocation of resources. HFG successfully conducted State-Level Health Account in the state of Haryana. Materials and lessons learned from the exercise in Haryana could be of value to other states and countries. HFG India is working to strengthen the public health system in key areas like reproductive health, nutrition, and TB. The current activities in this domain include research and analysis to support evidence-based family planning programming and financing and mentoring states in India to build a strong understanding of the framework developed by the National Institution for Transforming India (NITI), the Indian Government’s policy think-tank, to measure incremental improvements in health and nutrition. Aiming to improve the quality of and access to family planning services, the project is also providing structured support to strengthen the organizational and technical capacity of the civil society coalition White Ribbon Alliance (WRAI), a major network of grassroots CSOs engaged in family planning advocacy in the country. HFG is also conducting a political economy analysis of TB to provide guidance to government and development partners on addressing the social, economic, and political barriers to combating TB. 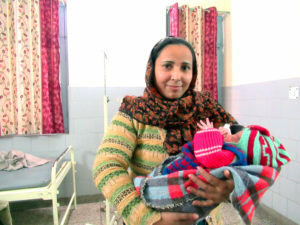 A mother with her newborn baby in the labor ward. Image by Thommen Jose. These activities will build on HFG’s substantial gains in health governance in the first phase, when the project’s thrust was on increasing the quality and use of health management information system (HMIS) data for evidence-based decision making; supporting activities aimed at strengthening the capacity to plan, develop, and manage India’s public health workforce; and undertaking research to inform the development of a sustainable Tibetan Medicare System (TMS). The project’s accomplishments in strengthening health information systems are of crucial significance. HFG successfully demonstrated a routine data quality assessment methodology by conducting a data quality assessment pilot across five districts of India; the pilot was aimed at informing the Indian Ministry of Health and Family Welfare’s (MoHFW) strategy for assessing data quality throughout the country. The project also undertook an assessment of state-level HMIS and data use to develop capacity building plans for improving HMIS data decision making and also developed a robust, interoperable geographic information system (GIS) application to improve the accessibility, analysis, and use of health data. Within the domain of HRH, HFG assisted Haryana State to design a performance appraisal system and a module for transferring medical officers and providing technical assistance to strengthen human resource and program management systems in Uttarakhand and Jharkhand, respectively. HFG’s mandate, as seen from its diverse activities in India, has been to address the challenges of achieving higher levels of health for the entire population, especially for mothers, children, and other vulnerable segments. The project’s approach in India focuses on developing innovative solutions that can be applied in other settings and even transferred to other countries. Working in partnership with the central and state governments and other development partners, HFG will ensure that all the proposed solutions are locally formulated and owned, and therefore sustainable.